BENGALURU: As more banks and financial institutions focus on a shift to digital technologies, IT services providers see IT budgets of the BFSI sector “under pressure”. 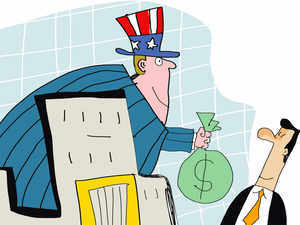 BFSI, or the banking and financial services sector, which has been the largest business vertical for companies such as Tata Consultancy Services, InfosysNSE -1.89 %, Accenture, Cognizant and WiproNSE -0.76 %, is now witnessing a decline in discretionary spending in the US, said Roger Park, partner, America’s Advisory, at consulting firm EY. “I think, generally budgets are being under pressure, cost is a major factor. There’s a lot of spend that’s been happening across transformation, responding to markets, regulatory scrutiny and compliance. So, there’s definitely not as much discretionary spends available. A lot of our clients have innovation funds, but they are also industrialising innovation within their organisations,” Park told ET in an interview. Many of EY’s clients in the banking industry believe “the ability to innovate is a competitive differentiator”, he said.EY, which competes with traditional IT players such as Accenture or TCSNSE -0.92 % in the consultancy and technology services, is seeing deals ranging from $1 million to $100 million in the BFSI sector. Banks and financial institutions are seen to be reducing budgets for traditional services and pump in the cost benefit towards emerging technology areas. “So, I think there is a lot of cost pressure on programmes that are focused on cost takeout. But if we need to enable a new business capability or technology capacity, then the value is much higher,” Park said, adding that the two models of services go “hand in hand” more often than not. Companies such as TCS, Infosys and others have seen sluggish growth in the financial services and banking business verticals, while Wipro has witnessed comparatively higher growth in this sector. While Infosys reported a 3.6% expansion in constant currency terms quarter-on-quarter at the end of December 2018, Wipro saw a 5.3% growth during the same period. Park, who is also an innovation leader for the financial services sector, said deals between startups and large banks hugely vary and startups at times look for one or two focused solutions.